The strike of the eagle talon is so powerful that its force is twice that of a rifle bullet. 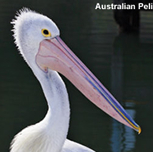 ... the Australian Pelican's beak is up to 18.5 inches (47 cm) long. Green Herons sometimes drop live insects, berries, or other objects onto the water's surface to attract fish. When an inquisitive fish appears, the heron grabs it with a quick thrust of the bill! 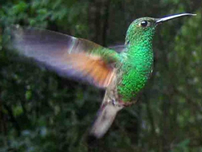 The smallest bird in the world is the bee hummingbird which measures 2.5 inches in length (6.2 cm) and weighs only 0.06 oz (1.6 g). The Northern Jacanas appear to be walking on water -- and because of that are also known as the "Jesus Birds"
Meet the only poisonous birds in the world! Male Frigatebirds have inflatable red-colored throat pouches, which they inflate to attract females during the mating season. The fastest bird in the world is the Peregrine Falcon, which can reach speeds in excess of two hundred miles per hour. The world's smallest owl is the elf owl which weighs 1.5 ounces and is the size of a sparrow. the bird without a voice? Vampire Finches drink the blood of other birds and their own deads. Such a behaviour has evolved from eating parasitic insects in the bird's plumage. 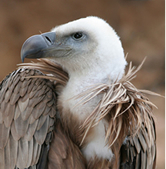 Vultures are said to drop LIVE turtoises from great heights to crack them open. 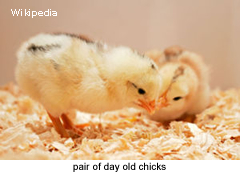 A chicken with red earlobes tends to produce brown eggs, and a chicken with white earlobes produces white eggs. A hawk's vision is so good that it can see a mouse from a height of one mile. Nowhere else but in the westernmost islands of Fernandina (Narborough) and Isabela (Albemarle) lives the world's only flightless cormorant, Nannopterum harrisi. This bird with its useless, drooping wings appears awkward on land as it plods along on big webbed feet, spreading its wings for balance. Before attempting to fish underwater the slightly built bird must first swallow pebbles to weigh itself down, then like a daredevil it plunges madly into the water feet first, diving to great depths to satisfy its hunger.